Note: Your specific Import Filter was selected when you created your data file in Step 1 of this Getting Started Guide. If this needs to be changed, please select the appropriate Account Tab and click Account, Edit from the menu to modify the Import filter for your broker. IMPORTANT: Please import a full 13 months worth of data. January 1 through January 31 of the next tax year if you are filing a cash basis account. January of next tax year trades are required for properly calculating wash sales. Beginning in TradeLog version 13, users can import beyond January 31 of the following tax year in accounts that are not MTM. This allows continued use of TradeLog until completion of the End Tax Year process. For example, in a 2013 tax year file you can continue importing after January 31 of 2014. Once you are able to complete the End Tax Year process all 2014 trades, as well as positions carried forward from 2013, will be moved over to the new 2014 tax year file created. Please see the lessons for importing in our Online Tutorial for a video discussion of how to use this function in TradeLog. 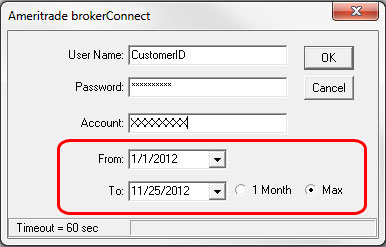 The Account Import Button on the toolbar should now display the name of your broker (ex. TD Ameritrade Imp). Specific instructions for methods of importing that are unique to your broker are located in our Broker Import Support Matrix. Note: If you need to change your broker's import method, select your broker's account tab and go to Account > Edit - for more information, see our topic on Editing Accounts. Select the brokerage account you will be importing for by selecting the appropriate Account Tab. All trade editing must be done in the individual account tabs on multi-account files. 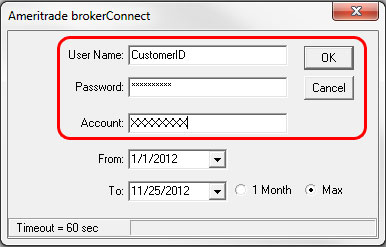 Enter your Customer ID and PIN that you use to log into your brokerage account online. Then enter the unique account number that you wish to import from. Select a date range by clicking one of the radio buttons as seen below. There will be different selections per broker. Note, TradeLog will automatically select the From and To date based on your range selection, you can change the From and To date manually as well. Note: For some brokers there will be a 90 day limit per import. If necessary, repeat steps A through D until all data has been imported.